Last night, in a renovated warehouse on the outskirts of Berlin, I donned an augmented reality headset, picked up replica of a lightsaber and awaited my fight with Commander of the First Order Kylo Ren. Settling in to the portable Star Wars Jedi Challenges headset I was skeptical it was going to be able to recreate some of my favorite sci-fi action scenes ever committed to film, but after only a 90 second demo I'm sold. The app allows you to fight some of the best Star Wars villains, including Darth Maul, Vader and newbie Kylo Ren. 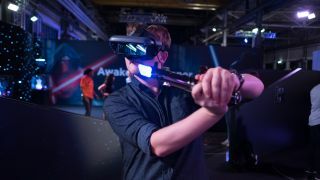 It includes a Lenovo Mirage AR headset, a lightsaber-shaped controller and a small round ball on a platform that works as a tracking sensor, which you'll need to place down in front of you to be able to battle. The lightsaber has some weight to it, so it doesn't feel like a plastic toy designed specifically for kids, but it's also not going to do any serious damage if you manage to fling it out of your hand as you're battling. I pressed the button on side of the saber to get started, and after it flared out in front of me I had only a matter of seconds to practice my technique (and try not to squeal at how awesome the sound effect was) before Ren appeared in front of me. I played Jedi Challenges with a black background in front of me, and Ren rendered particularly well, and felt much more 3D and lifelike than it would have if this was just a virtual reality experience, rather than an AR one. How this will work in your home though remains a little uncertain to me. I'd be a bit worried about trying to see these bad guys appear in your living room over the top of your sofa or your kitchen table. After taunting me, Ren began to approach and then attacked. The whole aim of the game is to block your enemy's attacks, which are visualized as a small yellow line where your opponent will next swing his saber. If you match up your lightsaber to the line you'll be able to block it. There's no physical feedback in the controller when he strikes, but the audio cues and visual representation does make you feel like you've just saved your own life. The whole experience started off slow, with Ren attempting to hit once or twice every five seconds, but by the end of the battle he was pummeling me with attacks left, right and center. I had to fend off six or seven hits with each attack, and that's when the game became exhilarating. When I'd blocked a few of his attacks, it was then my time to strike. I didn't need any Jedi training to be able to beat him, as a circle appears over the top of Ren as he catches his breath, but I needed to hit fast. Star Wars Jedi Challenges isn't perfect. Once or twice the lightsaber would drop out as the field of vision as the sensor wasn't wide enough, but that's something you'll soon learn, and you'll limit yourself to a certain amount of space. The lack of feedback in the controller is also a shame – a slight vibration as you're hit would have added a lot more to the experience. Hopefully, though, this opens up the power of AR to the mainstream further than Snapchat and Instagram have managed so far, and if any brand can connect with audiences it will be Star Wars. I loved the whole experience, and that's without trying out the other two parts of the game – there's also a version of Holo Chess, and a strategic battle game set within the Star Wars universe. Lenovo's Star Wars Jedi Challenges can be pre-ordered right now – it's coming out in October or November in both the US and UK for $199.99 and £249.99 respectively. You can watch the trailer for the game below.